Mermaid Taylor interacts with children while swimming in Newport Aquarium’s Coral Reef tank. NEWPORT, Ky. — Guests visiting Newport Aquarium might be surprised and delighted to find that mermaids have joined the finned inhabitants of our Coral Reef exhibit. For the second year in a row, the Weeki Wachee Mermaids have made their way upstream from their home in Weeki Wachee, Fla.
Weeki Wachee is home to the deepest naturally occurring spring in North America. Crystal clear and seemingly bottomless, this spring is the highlight of the 538-acre Florida state park—and happens to be home to more mermaids than humans! Looking into the pristine waters of Weeki Wachee Springs, it seems as though the spring should be inhabited by mermaids. In 1947, Newton Perry, a U.S. Navy veteran, was inspired by this very vision and purchased the springs. Seeing a potential business, Perry invented a more natural-looking method of underwater breathing and constructed a 16-seat underwater theater alongside the spring. As a previous Navy diving trainer, Perry was more than capable of teaching aspiring mermaids to perform 20-feet under the water breathing off of air hoses—in a tail no less! In no time, Perry’s mermaids began to attract attention, performing shows daily. By the 1950s, women were traveling from as far as Tokyo to audition to become a Weeki Wachee Mermaid, and celebrities like Elvis were attending shows. 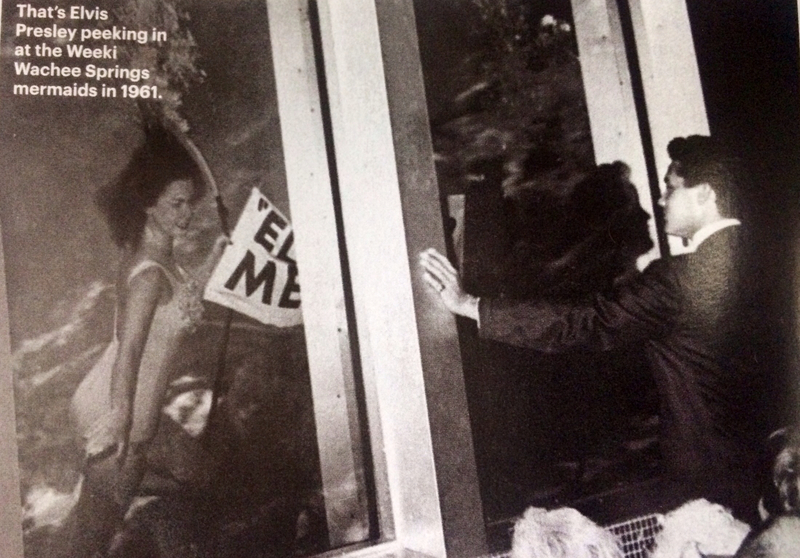 Elvis Presley visited the Weeki Wachee Mermaids in 1961. For the past 60 years, Weeki Wachee has carried on the same mysterious and enchanting legacy of mermaids, and has since become a Fla. State Park—technically making the Weeki Wachee mermaids government employees! Weeki Wachee Springs State Park continues to offer three mermaid shows daily, based on the story of “The Little Mermaid”. 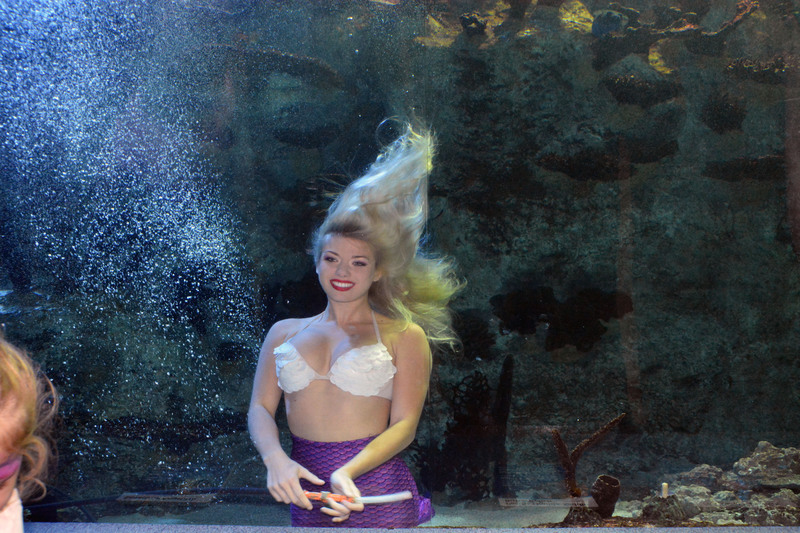 In addition to performing, the Weeki Wachee Mermaids have hit the road, traveling as far the United Kingdom, and regularly visit aquariums across the U.S. But … What does it take to become a traveling, Weeki Wachee Mermaid? Well, according to Mermaid Chelsea, almost a full year of intense training. After becoming scuba certified (which is a requirement), mermaid trainees first practice all of the underwater choreography without a tail, learning how to master the constant 5 mph currents present in the springs. Mermaid Chelsea has been a professional mermaid for 3 1/2 years. The next step is to practice the same choreography 20-feet underwater, breathing through an air hose. Only after those are mastered, do mermaid trainees attempt them in a tail. But, once you pass your mermaid test, you’re basically a mermaid for life. An average day in the life of a mermaid often includes two to three hours of underwater performances, and often features appearances from manatees, sea turtles, otters and even alligators. 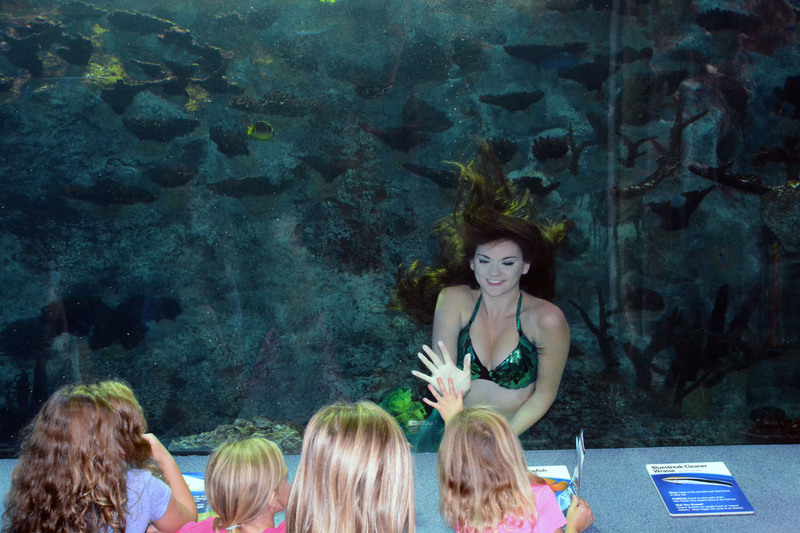 The Weeki Wachee Mermaids also regularly perform choreographed shows at aquariums, but here at Newport Aquarium, they have the opportunity to interact with each guest one-on-one. “I love Newport Aquarium. I love the fact that it’s up close and personal. Every kid almost gets his or her own personal interaction with a mermaid!,” said Mermaid Chelsea. The Weeki Wachee Mermaids at Newport Aquarium can be seen swimming in the Coral Reef tank from 11 a.m to 4 p.m. through Oct. 12. After encountering these amazing creatures here at Newport Aquarium, it’s possible that you might just be interested in becoming one yourself. “Just keep swimming. Really practice, and feel free to come try out. We have tryouts all the time!,” said Mermaid Chelsea. But, if you’re not interested in quitting your day job, Weeki Wachee Springs also offers weekend-long Adventures of the Spring Mermaid Camps for children and Sirens of the Deep Mermaid Camps for adults. This entry was posted in Mermaids and tagged Elvis, Mermaid, newport aquarium, U.S. Navy, Weeki Wachee Mermaids, Weeki Wachee Springs State Park by NewportAquarium. Bookmark the permalink.